There are so many benefits to exercising while you’re pregnant! Endorphins—nothing beats that positive feeling after a workout. Mental well-being—feel stronger even while experiencing common pregnancy symptoms (like nausea during the first trimester). Better sleep—between morning sickness and needing to use the restroom more often, quality sleep is needed! Physical benefits—staying active can reduce some common pregnancy symptoms and often contributes to maintaining a healthy weight gain during pregnancy. The American College of Obstetricians and Gynecologists (ACOG) gives you more reasons to maintain a workout routine during pregnancy. Always talk with your doctor or midwife to find a workout routine that works best for you since every pregnancy is different. Walking – Walking is a great place to start if you haven’t been exercising and a good addition if you have already established a fitness routine. Swimming – Making a splash in the pool can provide one of the safest exercises while you’re expecting since it is low impact and the water supports your joints and ligaments. Feeling buoyant in the water despite pregnancy weight gain is a bonus. 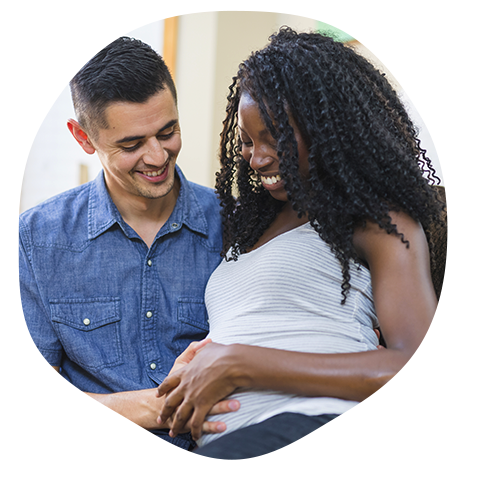 Yoga – Find a local prenatal yoga class to connect with other expecting moms. There are lots of prenatal yoga videos online too if a class doesn’t fit your schedule. Kegels – These are one of the first exercises you can do post-delivery, and are important to perform throughout pregnancy. You can read more about the importance of Kegels, and why you should do them every day. ACOG shares that “if you were very active before pregnancy, you can keep doing the same workouts with your health care professional’s approval” during the first trimester. Running, spinning, strength training, swimming, barre and Pilates are all good options if they’re already part of your lifestyle. Listen to your body, and take a break when you need to do so. There are so many physical and hormonal changes during this time, so don't be hard on yourself and keep realistic expectations. Also remember to stay hydrated before, during and after exercising, as your blood volume is increasing progressively. Having increased energy is a huge bonus during the second trimester, but it’s also when you may start to notice changes in your body. It is common to feel more tired during the third trimester. You may choose to focus on low-impact exercises during this stage of pregnancy, and especially focus on yoga, as strengthening muscles for birth is important at this point. You may enjoy doing workouts that are aimed at pregnancy or participate in prenatal classes in the second and third trimesters, and you can still continue many of the same exercises you’ve already been doing. Start making modifications as needed during the second trimester. If you have a low-risk pregnancy, you can continue doing planks for ab work, but avoid sit-ups or other exercises where you need to be flat on your back. You’ll probably need to keep taking breaks more often for water too. Maintaining a workout routine beforehand can help set you up for success post baby. Once you’re cleared by your doctor to return to exercise, you are one step ahead regarding postnatal fitness since you’ve already established the habit.